Darra Jackson, a member of the inaugural class of the WKU Chinese Flagship Program, has been awarded a multi-year Chinese Government Scholarship, funded by the China Scholarship Council and China’s Ministry of Education. Jackson, of Atlanta, is a sophomore in the Honors College majoring in International Affairs. She was attracted to WKU because its motto A Leading American University with International Reach demonstrated the university’s emphasis on study abroad. Jackson has been studying Chinese for a year at WKU, and the Chinese Government Scholarship will enable her to travel to China for the fourth time. For Jackson, the Chinese Flagship Program at WKU not only helps students develop language skills and cultural fluency, but also works to prepare students to succeed in a globalizing world. Dr. Liping Chen, Academic Director of the Chinese Flagship Language Institute, is delighted that Jackson received the award. “I am very glad for her. She has made impressive progress since she joined our Flagship program,” she said. The Chinese Government scholarship gives Jackson the opportunity to immerse herself in the language for four to five years at any university in China. 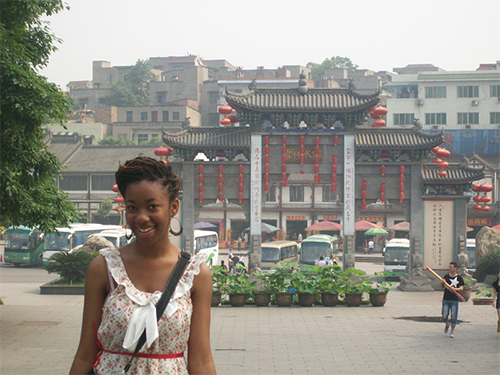 Jackson has chosen to study at Beijing Language and Culture University; her studies will begin this fall. In addition to a full tuition remission, the scholarship also covers housing, books, medical insurance and a monthly stipend. This year, more than 200 students applied through the Chinese Embassy. According to Xiao Liu, who works in the Education Office of the Chinese Embassy in Washington, D.C., the Consulates-General review the applications and make their recommendations back to the Chinese Scholarship Council. Yuan added that for Jackson to receive such a competitive scholarship is a reflection on the high quality of students at WKU and in the Chinese Flagship program. About the Chinese Flagship Program: WKU’s federally funded Chinese Flagship program is designed to bring talented students who start with no knowledge of Chinese up to Superior levels of proficiency by the time they graduate from college. WKU is one of nine universities funded for Chinese by The Language Flagship through the National Security Education Program. If you are interested in Chinese language or cultural programming, contact Melinda Farmer at Melinda.farmer@wku.edu or call the Office of Scholar Development at (270) 745-5043 to schedule an appointment. Contact: Jeanne Sokolowski, (270) 745-2764.